Update: Sahara Sands casino recently switched hands and became pretty much unreachable. Therefore, we can no longer recommend it to our visitors. 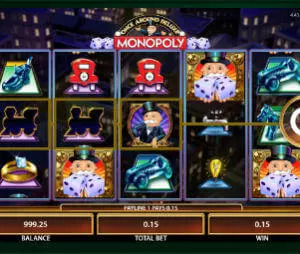 If you were looking for a US friendly Rival casino with a no deposit bonus, you should check Slots LV or Ignition casinos. Both of them offer superb support, fast payouts and games by Rival, RTG and BetSoft. Sahara Sands casino is one of 3 dormant Rival casinos that where acquired and relaunched in 2014. Good Rival casinos, especially ones that accept US players, are hard to find and we were glad to see that the new owners placed those casinos on the right track. It’s been a year now since the relaunch and the responses we see and get from players are very high, especially when it comes to fairness and speed of payouts. 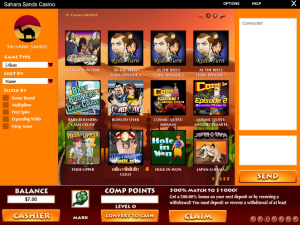 These days you can try this Sahara Sands Casino with a $/£/€ 7 no deposit bonus. The most popular games at Sahara Sands are the Rival’s famous i-Slots. They are stuffed with bonus games, game in game features and thick story line. If you haven’t tried those – you should. The ones I recommend to start with are one of Reel Crime slots, Midway Madness and As the Reels Turn. Besides the i-Slots you have regular video slots and classic 3 reel machines. If you like to mix things up you can enjoy a wide variety of Blackjack, Video Poker, Bingo and Scratch Card games. In total, Sahara offers over 200 casino games which you can play using the download version. If choose the in-browser version you will have slightly lower range of 150 games. Sahara Sands gives you $/£/€/AUD 7 free bonus to try the casino. You can’t win much using the bonus, since the maximum withdrawal here is 49 $/£/€, but it is a nice way to check the games and maybe win some money on the way. The maximum bet per spin is $/£/€ 0.7 and you have to play more than 10 different games. Sahara Sands Casino offers its new players a nice welcome bonus package. On your first deposit you will get a 300% bonus up to $/£/€ 600. Once the bonus completed, you will get additional bonus of 100 Free spins. Sahara Sands bonuses has few terms that you should be aware of. First, you need to wager the bonus and deposit 35 times and to do it on at least 7 different games. Second, maximum bet per spin during the bonus is 10% of the deposit amount. Third, the maximum cashout on this bonus is 5 x Bonus plus Deposit. If you wish to avoid the max cashout limit – it is possible. In the cashier you will find additional promotions with lower bonus %, such as a 100% match bonus. These ones have no cap on winnings. We have to admit that Sahara Sands mobile design is boring. However, if you can ignore the grey lobby page, the mobile casino is actually quite good. There are over 30 mobile slots, including some new and exciting names such as Leonardo’s Loot, Vintage Vegas and Ocean Treasure. The games are well adjusted and fun to play, even on the smallest screens. The minimum deposit amount at Sahara Sands casino is $/£/€ 20. The maximum withdrawal is $/£/€ 4,000 per week. The withdrawals are processed within 3-5 days. Sahara Sands online casino was acquired and relaunched in the beginning of 2014. It is licensed in Curaçao and it is sister to Tropica, Ricardo’s, Gibson and Cashalot online casinos. So far we’ve tested 4 out of 5 casinos and the overall impression is very positive. We’ve also researched their historical details and since the re-launch, the casinos have no player complaints that is worth mentioning. The only aspect you need to pay attention is the bonus terms that we’ve listed above. Over than that, you are good to go. Sahara Sands is a solid slots directed online casino. It offers great variety of Rival games and high bonuses for new and existing players. This is a great destination for US casino players looking to play slots online.